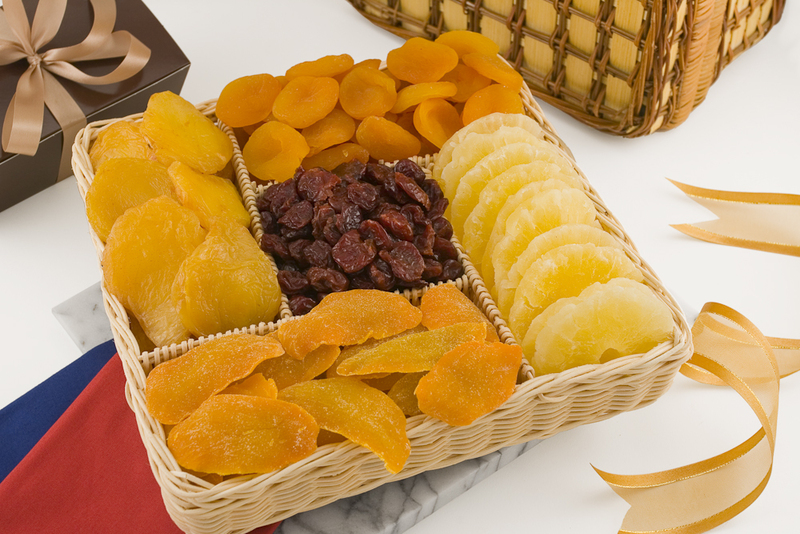 A generous assortment of healthy, soft, naturally sweet, plump dried fruits. They are beautifully arranged in a reusable wicker tray. A thoughtful gift for the health conscious on your list. Contains: Dried Cherries, Jumbo Apricots, Dried Mangos, Dried Pears and Dried Pineapples. Fruit and Nut Basket - Net WT. 3.5 lbs. Don't know specifics, as item went to sick Aunt in Florida. However, can say that item was selected online, because of free shipping. Wonderful Gift. Everything fresh and presented well.. I have purchased this product for a Christmas gift based upon products that I have purchased from Superior in the past. Everything was excellent...just as it has been for last years I have used Superior Nut Co. Every time I send baskets, they comment on the quality and presentation of the gifts. I have recommended this company to several of my friends , who have also purchased and been very satisfied. I love the â€™create a basketâ€™..which was perfect for me this year as there were no special macadamia nuts (only) gift sets. The baskets arrived today in perfect condition...thank you.